A reduction in nitrate load in the area of Bowscar and Plumpton head affecting the groundwater drinking water quality in the aquifer. A reduction in sediment and phosphate in the Petteril catchment by addressing both source, pathway and receptor issues. One method we hope to explore further as a group are Natural Flood Management techniques, and help deliver Multiple Environmental Benefits for diffuse pollution, flood risk and biodiversity. To investigate the possibility with the group to address Flood and Coastal Risk Management at Newton Reign on the River Petteril through Natural Flood Management. 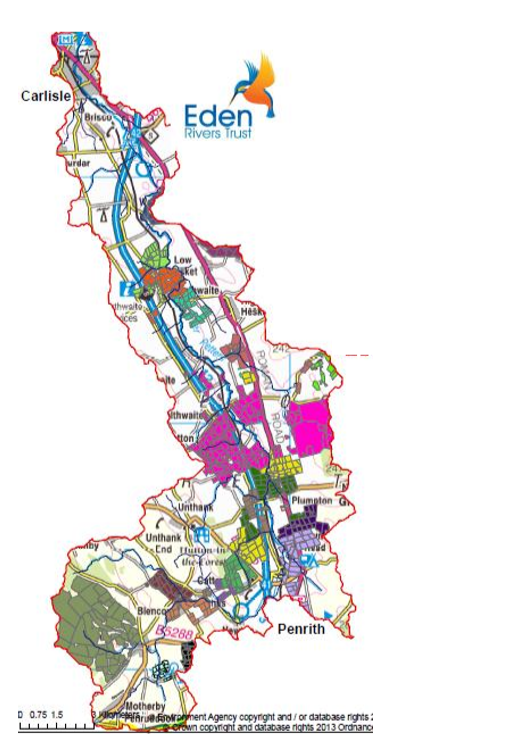 To work through the saving Eden Catchment Partnership with Forestry Commission and the Woodland Trust to deliver increases in water quality, biodiversity and flood risk in the River Petteril catchment through strategic woodland and riparian planting. To achieve multiple environmental benefits by facilitating cooperation at a landscape scale that restores landscape features in a way that can slow down water movement through the landscape and establish settlement ponds to help trap sediment and reduce flood risk. We are aware of several historic features within the Petteril catchment and we will work with the county archaeologist to ensure these are captured in any agreements. Landscape improvements through boundary restoration that will also act to slow down the speed of over land flow to deliver multiple benefits to flood risk and diffuse pollution.